Urinary leg bags are discreet urine collection bags that are used to collect urine from catheters. They are wrapped around legs or thighs and held in place by means of straps and holders. For people who need more freedom of movement to lead an active lifestyle, leg bags prove to be very beneficial. They can easily be worn under clothing with full privacy. These urinary drainage bags can be attached to external or Foley catheters. How to choose the Right Urinary Leg Bag? While buying a urinary leg bag, factors like leg bag capacity, usability, drainage valves, length of inlet tube, type of leg bag straps, etc., should be considered for the successful collection of urine. Large capacity leg bags can store larger volumes of urine and need fewer changes as compared small capacity leg bags. They are perfect to use when you are going out or where easy access to toilet is not possible. Smaller capacity leg bags store less amount of urine and need frequent changes. They are easy to handle and carry along. Reusable: Reusable urinary leg bags can be used multiple times. They are cost efficient because less number of leg bags are required over a period. Disposable: Disposable urinary leg bags are to be used only a single time. They are disposed of after using and help in preventing infections. Flip Flo Valve: Flip flo valve allows for quick and hygienic emptying of urine. Leg bag with flip flo valve is perfect to use when frequent emptying is required. Twist Valve: Leg bag with twist valve helps provide hassle-free emptying. T-Tap Valve: T-tap valve is ideal for one-handed operation. Its small shield protects fingers from contamination. Anti-Reflux Valve: Urinary leg bag with anti-reflux valve helps in preventing the back flow of urine from leg bag to bladder. Choice of inlet tube length depends on the position where you want to attach the leg bag. Short tube is used to attach the leg bag to the thigh. Long tube is used to attach the leg bag to the lower leg. Adjustable inlet tube gives an added length to sheath patients. Leg bag sleeves or holders are used to hold the leg bag comfortably against the leg. They provide maximum support and security by completely encasing the leg bag. Leg bag straps help in securing the leg bag to the leg. They can be adjusted to the accurate fit with the help of buttons or Velcro closures. Latex Straps: Latex leg bag straps are constructed of latex material. They help in attaching the leg bag to thigh or calf. Fabric Straps: Fabric leg bag straps prove to be a good alternative to people who have latex sensitivities. They are very soft and comfortable. Take a urinary leg bag and position it on the leg in such a way that the protective cap of the bag is pointing up towards you and the outlet valve is pointing down away from you. Secure the bag with the help of leg bag straps or holder. Do not over-tighten them as they can restrict the flow of blood. Take an extension tubing and place it in an approximate position with its plastic connector end facing towards the catheter. Extension tube should be short enough to prevent kinking and long enough to prevent the risk of catheter pull. You can also cut the tube end without connector to get the desired length. Keep the drainage spout closed and remove the protective cap from the urinary leg bag. Use an alcohol‐saturated pad to clean the cut end of tubing and top connector of urine bag. Attach the connector of leg bag to the extension tube. Use another alcohol‐saturated pad to clean the connector end of tubing and catheter end. Attach the catheter to the extension tubing connector. Adjust the straps and leg bag according to your needs. Thoroughly wash your hands again. Keep the urinary leg bag below the bladder level. Hold the bag over the toilet or container. To empty the urine, open the drainage spout of the leg bag and completely empty the urine. While emptying, the bag should not touch the rim of the container or toilet. Take an alcohol‐saturated pad and clean the drainage spout. After cleaning, close the drainage spout tightly. Take the leg bag and pour some warm soapy water into it. Shake the soapy water such that it does not come out of the corners of the bag. Open the drainage spout and drain the soapy water. Close the spout. Pour 2 parts of vinegar and 3 parts of water in the bag. Shake the solution and let it remain in the catheter leg bag for around 30 minutes. Drain out the solution from the bag and rinse with cold tap water. Hang the urinary leg bag and allow it to air-dry. Where to buy Urinary Leg Bags online? 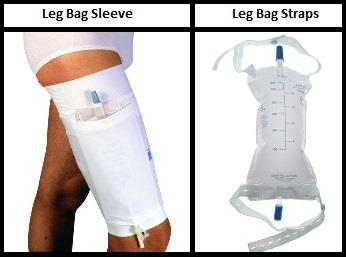 You can buy Urinary Leg Bags online at shopcatheters.com. Our extensive range includes urinary from renowned manufacturers like Bard Inc, Cardinal Health, Coloplast and many more.